The holidays are here. Whether your business is bustling or sleepy this time of year, you may want to schedule an auto-response for folks who contact your Textline number during the holidays. 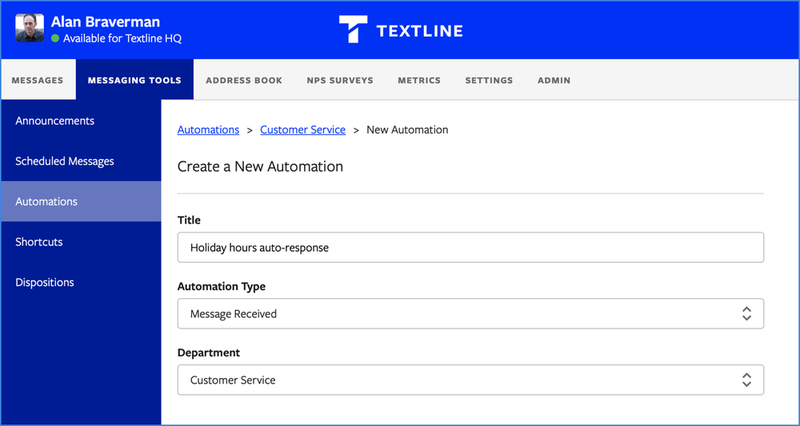 Follow along to learn how to use Textline's automations feature to configure your own holiday auto-response (or even an after-hours auto-response that works any time of year). As you can see from our auto-response message, we'll be out of the office on Xmas Day and New Year's Day. Those holidays both fall on Tuesdays this winter. How do we configure our auto-response to trigger on holidays, even during business hours? To do that, we won't specifically schedule our auto-response to take effect on those holidays. Rather, we'll make sure all our Textline agents set their status to unavailable on those days, and we'll put our auto-response to work whenever we have no agents available or when someone texts us outside business hours. Step 1: Create a new automation. Step 2: Configure the conditions that will trigger the auto-response. ﻿Step 3: Compose the auto-response text message. ﻿Now our holiday auto-response is up and running. After January 1st, we'll edit this automation to remove the postscript regarding Xmas and New Year's Day. This will function perfectly fine as our standard after-hours auto-response for the rest of the year.